The American Chemistry Council (ACC) reports that U.S. specialty chemicals market volumes ended the fourth quarter of 2018 on a solid note, rising 0.6% in December after a 0.3% gain in November and a 0.2% gain in October. All changes in the data are reported on a three-month moving average (3MMA) basis. Performance chemistry reflects trends in manufacturing. Of the 28 specialty chemical segments ACC monitors, 19 segments expanded in December, up from 18 in November and 12 in October. Six markets experienced decline and three featured no change. During December, large market volume gains (1.0% and over) occurred in foundry chemicals, lubricant additives, oilfield chemicals, plastics compounding and textile specialties. 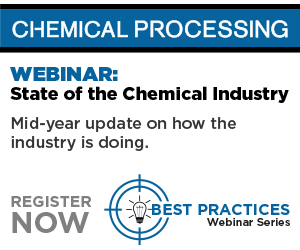 During December, the overall specialty chemicals volume index was up 4.2% on a year-over-year (Y/Y) 3MMA basis. The index stood at 115.0% of its average 2012 levels in December, which is equivalent to 7.83 billion pounds (3.55 million metric tons). On a Y/Y basis, there were gains in 19 market and functional specialty chemical segments. Compared with last year, volumes were down in nine segments. For 2018 as a whole, the overall specialty chemicals volume index was up 4.4%. Segments with strongest gains were oilfield chemicals, electronic chemicals, corrosion inhibitors and flavors and fragrances (tied), cosmetic chemicals and foundry chemicals.